Before reading this novel, I was not familiar with the author. In fact, I never looked him up while I was reading the book. My expectations of this book were something around a fluffy, unmemorable book, with pencil illustrations throughout. I was so wrong! This book is still with me, even 20 books later. I did get this through Edelweiss in exchange for an honest review. El, short for Laughter, is going to a prestigious art school, her parent’s alma-mater. While it is expensive, it will allow El to artistry. She is extremely nervous about being the new girl and making friends with new people. 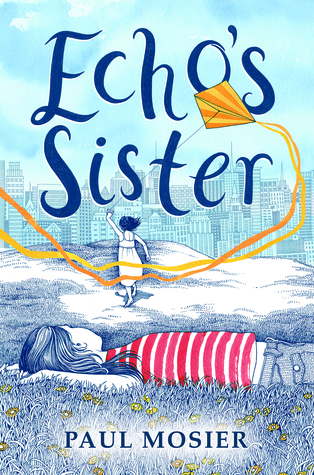 All of that takes a back-seat, when her younger sister Echo is diagnosed with cancer. El, expectedly, becomes concerned for her sister and her life’s focus alters to help her sister and family. El doesn’t work to become friends with anyone at her new school, though one (cute) classmate won’t be deterred. El’s family lives by their new motto “all for one and one four all,” young Echo’s spirits remain high, even in the face of terrible cancer treatments. El finally shares her family life with her new friend at schools and they all band together to help in any way they can. There are certain books you read and know the author just gets it. Their characters, plot, and voice just seems so real. It’s a layer that can only be achieved when an author has personal experience with the subject. This came through before I even read the author’s note or looked him up on Goodreads. This story parallels many of his own personal experiences. I appreciate the honesty that this book brings to light. El does not do everything that one traditionally expects her to do…like cut her hair in solidarity with her sister. She welcomes the support of those around her, but not with a stoic/unrealistic face. She will not allow her family or sister to be used. I loved the tension between loving and hating the support of those looking in on her family. I thought that the secondary characters were fascinating and well-developed. The art teacher was both strange and fascinating. I really want to see how El draws/views the people around her. I truly enjoyed this book and will recommend it to others.